While church bells chime solemnly through the valley to initiate the Christmas feast, the farmer takes down his rifle from the wall, goes out into the yard and shoots three shots over the barn roof. For Christmas is a magical, yet dangerous time, and when it comes to scaring away the evil forces of the world, there is nothing more reliable than bullets and gunpowder. The old year is about to come to an end, and a new is underway. The shots protect against the darkness and the higher the blow, the better. Åsgårdsreien (The Wild Hunt), by Norwegian artist Peter Nicolai Arbo (1872). Today, Christmas for many represent a holiday consisting of family gatherings, joy and comfort – a century ago however, the same season was often associated with something scary and dangerous. Virtually all of the supernatural beings of the folk belief were out and about on Christmas Eve. Considered particularly dangerous at this time, it was important to safeguard against these abominations – consequently, a number of superstitious practices were put into action and carefully maintained from generation to generation. The best way to protect against them was to stay indoors and, above all, avoid places where they could conceivably go – like churches, where the undead held their Christmas sermons, and could not bear to be disturbed. Or to make sure all Christmas preperations were on schedule, thus preventing the fury of Lussi. Nevertheless, the most gruesome of all of these supernatural visits, was Asgardsreia (oskureia = the frightening race/ride). It was a boisterous procession of brawlers, murderers, drunkards, charlatans and wenches (!) who went flying through the air on fire-breathing horses, some with their heads under their arm. Provoking savagery and vandalism wherever they came, they made quite the fuss to say the least; besides drinking up the Christmas brew and abducting people and horses, they also bore with them ominous predicts of brawls, murder and suicide. Although obviously bearing strong resemblance to the creature Lussi, who would ravage about with her entourage the night of December 13th, Asgardsreia must have been even worse still; for Lussi could be appeased. This wild hunt of ferocious ghosts on the other hand, could not. 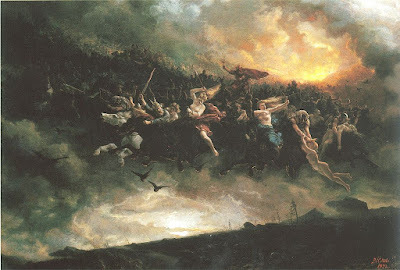 "These Norwegian traditions constitute a fearsome force; Lussi pales in comparison," Swedish folklorist Martin Nilsson wrote in 1938. A generally valid self-defense against both Asgardsreia and other evil spirits, were the cross. To crucify all doors, outbuildings and farmhouses with tar, coal, chalk or blood was one of the last chores to be performed on Christmas Eve. 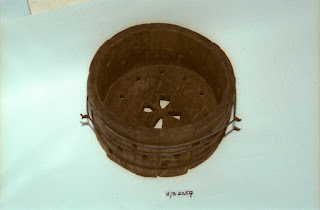 Similarly, tool, kegs, chests, pestles and tubs were marked or engraved, and the farm animals were branded with a cross of tar on their forehead and on the lower leg. The most extensive use of defense against Asgardsreia however, involves the use of various types of steel. (This practice is otherwise reflected in legends about the water demon nøkken, where one could protect oneself from being taken into the depths, by throwing steel in the water). The tradition of the Christmas Eve “shooting” (as depicted initially), may be viewed as a continuation of the use of steel as protection. The records does not tell us why steel was believed to be safeguarding; the belief that it was magical and able to prevent against evil forces, is however international. Humans started using iron for around 5,000 years ago – initially, iron originating from meteorites. The iron thus literally came from the heavens where the gods lived, and iron was therefore considered sacred and attributed power and strength. There is no denying that for the younger generations, the temptation to imitate this wild bunch of ferocious beings at some point became too great to resist. Hence, around Christmas time, one might experience "woosy juveniles, gadding about in the districts, taking people’s horses and making all sorts of pranks” (as witnessed by Andreas Faye, as late as in 1843). And with several months ahead of them, with winter, cold and darkness, who could in fact blame them? For others not taking part in this merrymaking however, “reia” would become twice as troublesome, threatening the Christmas peace. In retrospect, it is natural to assume that actual experiences with Asgardsreia stems from encounters with noisy, drunken youths. However, the folk tradition also contains many accounts of "abductees", who found themselves in a state of dreams or trance, undertaking long journeys with the procession while staying at home fast asleep. The casualties trigging these supernatural experiences might have been real enough, such as the impact of winter storms, darkness, intoxication or pathological conditions. But the basis for them was the belief that this dangerous herd of wraiths, revenants and malevolent spirits, came to make the holidays unsafe. 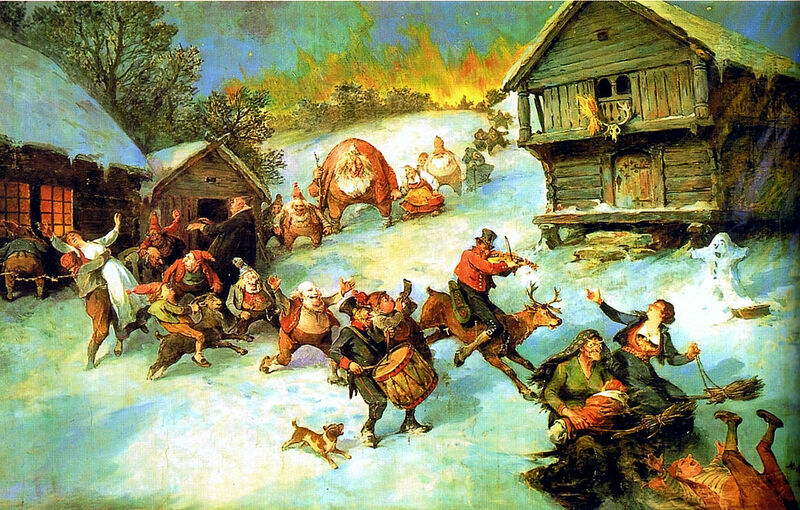 The humorous painting Julereia (1922) by Nils Bergslien shows a chaotic, festive crowd of goblins, wights, witches, drunkards, murderers and other mischief-makers, rambling about through a Norwegian farm yard on Christmas night. Hopefully, the real life imitation of Asgarsreia resembled this pack, rather than Arbo's version. 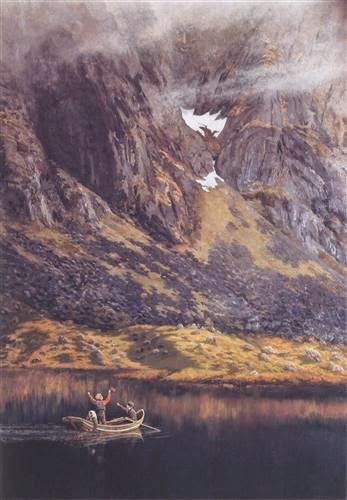 Ørnulf Hodne (1996) Jul i Norge. Gamle og nye tradisjoner. J.W. Cappelens forlag. 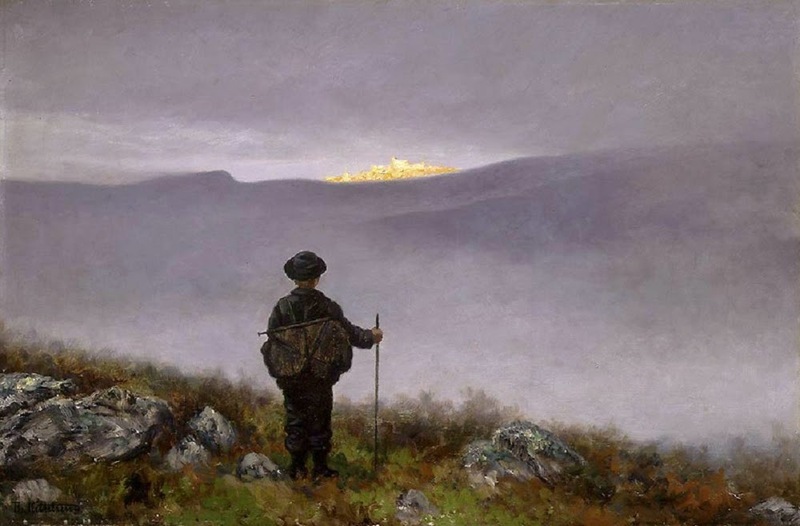 Ørnulf Hodne (1999) Norsk Folketro. W. Cappelens forlag.